Although the academic year is winding down, Dr. Lorrie Frasure-Yokley, Associate Professor of Political Science at UCLA, is only getting started. In addition to her own teaching, research, and initiatives for first generation students, she is also organizing the upcoming Collaborative Multiracial Post-Election Survey (CMPS) Summer Research Conference at UCLA’s Luskin School of Public Affairs on August 8-10, 2018. 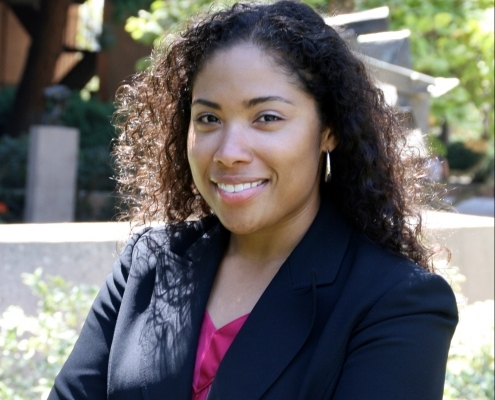 We caught up with Dr. Frasure-Yokley, in a two-part series, to learn a bit more about her passion for research and educating the next generation of policy makers and researchers. LASS: Where are you from and where did you go to school? LFY: I grew up on Chicago’s south side where I attended Chicago Public Schools, K through 12. I went to the University of Illinois in Urbana-Champaign for undergrad, and then onto the University of Chicago for a Masters in Public Policy. During my MPP program, I got an internship at the General Accounting Office, now, the Government Accountability Office in Washington, DC, and I was offered a full-time job after graduation, but I knew that my heart really was in academia. I wanted to examine politics and policy, but I wanted to have greater autonomy? I decided to continue on and apply for PhD programs, but I’m also pragmatic, so I decided to apply in the Washington, D.C area just in case I didn’t really like the PhD program. I actually deferred my job. I deferred my position in Washington, D.C, and I started at the University of Maryland, College Park for a PhD in Political Science. LASS: Tell me about teaching. What classes are you teaching right now, and why did you decide to teach those classes? LFY: Sure. I am teaching an undergraduate course called Introduction to Race, Ethnicity and Politics [REP], and we trace, in the first half of the course, the socioeconomic, political, and cultural road of various racial ethnic groups, blacks, Latinos, Native Americans, whites, Asians in the country, and we look at their development in the US until the post civil rights movement, so 1965, 1970. Then, we use the lens of their historical and cultural and economic and social trajectory as a lens through which to examine various policy issues, voting rights, political behavior, public opinion, other kinds of political issues of our time. It’s a small course, which I value in this department to be able to teach a small course and I always get to have greater interaction with students than I do in my larger courses. Then, I’m teaching a graduate course. It is a rewarding experience to bring the intersections of not just race and ethnicity, but race, ethnicity and gender to the study of political behavior, public opinion, and ideology, these kinds of other factors that we care about in political science…the lens of the course is intersectionality. We look at all of the readings through the lens of the role of disparities and oppression of particular kinds of marginalized groups, but the intersections of race, gender, class, sexuality, ethnicity, national origin, immigration status. LFY: It’s my first time teaching this course, and it is a packed house. I have 17 wonderful graduate students. It’s a very large course. LASS: That’s a big class for the graduate level. LFY: It’s huge, but every week [holds] new discoveries, because we’re challenging one another to think about race, ethnicity, and gender beyond the dummy variable. Today’s course, we read two books on white womanhood and conservative politics. Mothers of Massive Resistance is one new book that challenges our notions of whiteness and white womanhood and the role that white women played in shaping the conservative right movement. It’s just a spirited class. It’s a great class. It’s a lot of work, because it’s challenging our paradigms. It’s challenging white women as the reference category. What does that mean? What do we lose by not truly theorizing about white womanhood? We fought so long in REP to have a space to theorize about black women and Latinas and Asian-American women. What have we lost by failing to theorize about white women, for example, and the intersections of class and race and place and geography for white women. Now, I also teach the Politics of American Suburbanization, which is like an urban politics course, but I incorporate various modes of geography, instead of just thinking about the role of the nation state, and the role it played on why our geographic space looks the way it does, and why it’s stratified in the US the way it is between city and suburb, and rural areas. LASS: Tell me this, then. Of all the classes that you can teach, why specifically the topics that you decided to teach on. Why is that important? LFY: When I was in graduate school, there was not a formal space for the study of race ethnicity in politics. The field is relatively new. The majority of scholars who study race, ethnicity in politics may have opted for the field of American politics, which is a more traditional field in political science. Although we do have REP scholars who are in comparative politics or political theory, and so forth, but the majority of them are in American politics. How do we create theories and methodologies that fit well… in terms of really positioning the role of race and ethnicity, and what that means for modern politics? It’s not a one-size fit all when you examine various racial ethnic groups. We have a race ethnicity and immigration (REI) lab where students can workshop their work at any stage of the process. We’ve been working so hard over the last 11, 12 years to create a dynamic and inclusive space for the study of race, ethnicity and politics at UCLA. Our students are thriving. We had numerous students on the job market this year, and all of our students, whose primary field is REP have been placed in both post-docs and tenure track jobs this year. Our students are getting external funding, research grants, publishing widely, and securing top jobs all around the country. We have a lot to celebrate. She will soon have a courtesy joint appointment in African American Studies.